Three bedroom home located on a private neck with guard house in Cataumet with all that is necessary for a great vacation close to home. Great restaurants, coffee shops and activities for the children nearby. First 5 to book for a summer vacation with necessary deposits will receive a special bonus of a 50 dollar gift certificate to the nearby Chart Room - well known in the area for wonderful food, cocktails and fun. Other bonus may also be available. 3 bedroom, 2 bath home, full kitchen, gas grill, 3 decks, washer / dryer, 2 dens, dining area, living room. 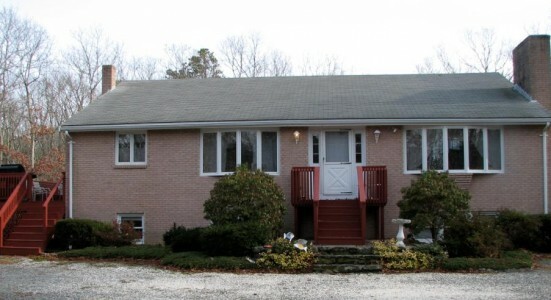 large driveway, linens available upon request, 2 cable tvs, and internet access. Main beach just a quarter mile from the house, tennis courts, boat launch, play ground all located on the island. The road around the island is just 2 miles and great for an evening stroll or morning jog.Â Bring your bikes for added fun. Great restaurants, coffee shops (muffin top bakery a favorite), sandwich shops, putt putt, bumper boats, ice cream shops just a short drive to 28A. Just a little farther are go carts and the cape cod canal( if you like to fish, walk bike or just watch the boats). Falmouth / Mashpee attractions include Woods Hole, light houses, Old Silver Beach, ferry to the Vineyard, movies, shopping areas (Falmouth Center and Mashpee Commons) and of course more good places to eat. Lease must be signed and accompanied by security and 1/2 rent. The remainder of the rent is due 1 month prior to your booking. Book Early for best selection.